The cast of An Octoroon is fabulous — funny, sharp, imaginative, courageous. This company is tight, it transforms its delightful costumes into normal apparel, and much of the play is very funny except when it’s suddenly appalling. Mind you, the horror has been there all the while. An Octoroon is effective. Then what about it irks me so? Comedy is hard, and particularly terrifying when it’s about serious subjects. Branden Jacobs-Jenkins’ play, while a hit last year at SoHo Rep and receiving accolades this year in a new production with Theatre for a New Audience at the Polonsky Shakespeare Center in Brooklyn, is to me a brilliantly executed (cheers to director Sarah Benson and the aforementioned cast) schoolroom exercise in theory, with a cast that makes it appear complete when it’s not done baking yet. It works much of the time until the author interrupts to tell us how clever he is, and how he’s manipulating us. Melodrama is supposed to make us feel, not think, but playwright Jacobs-Jenkins wants both. I don’t mind a good manipulator, and this play has plenty of points to make, in its beginning in the present leading to the play within the play. The playwright tells us this play is about race and race relations and morality. And yes, doing any version of An or The Octoroon will generate passions surrounding those subjects. 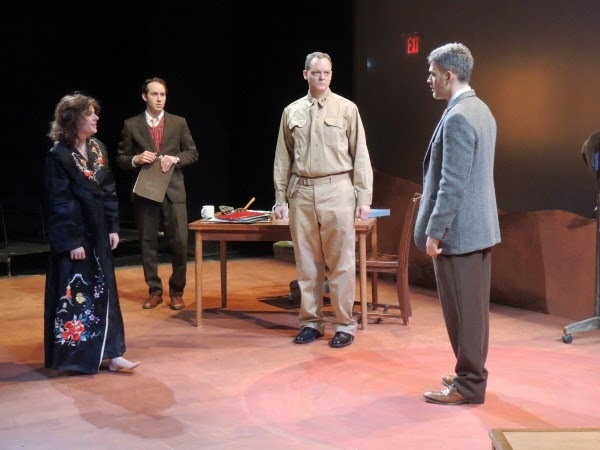 The problem is that the playwright’s attempts at cleverness interrupt the play, stopping the action and extending what should have been a longish one act to an overlong two act. Jacobs-Jenkins’ fascination with mid-nineteenth century melodrama, particularly a play by Dian Foucicault, is the basis on which he stages the issues he wishes to discuss in this play. The 19th century playwright Foucicault appears to be a character in the play within the play, along with the narrator/playwright of this play. Yes, it’s that confusing. The opening of the evening immediately distanced me from it when the playwright’s stand-in opens the play with a conversation between said playwright and his therapist. Luckily it’s not actually Mr. Jacobs-Jenkins, but rather the delightful newcomer Austin Smith, who plays the playwright in the present, a romantic hero visiting a plantation in the melodrama (George), as well as the mustachioed white villain of the piece (M’Closky). Oh yes, he’s in whiteface for most of the evening. Brilliant. Foucicault’s play was called “The Octoroon,” which is a person who is 1/8 black. 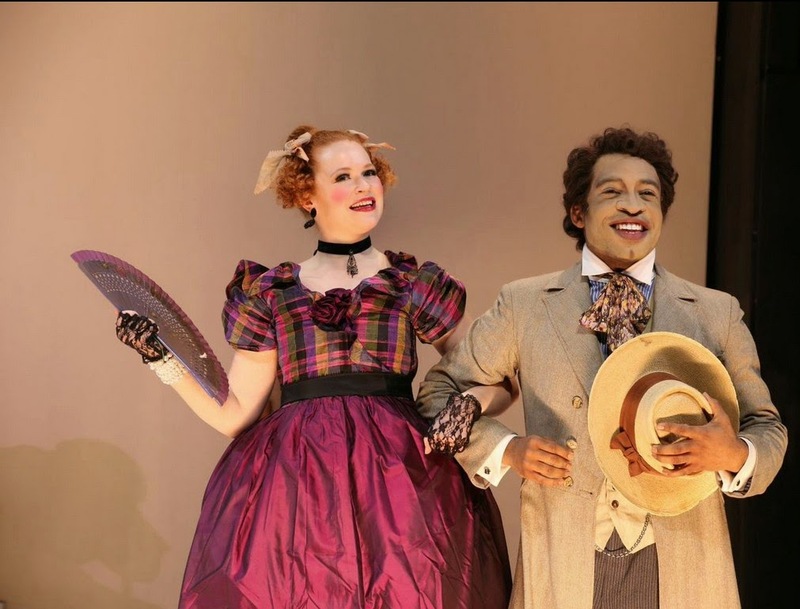 The new play is called “An Octoroon,” but it is not about a woman who is 1/8 black. It is about us, white people, black people, what happened then, what’s not all that different now. The title character, Zoe, is beautifully portrayed by Amber Gray, who sings, and laughs, and loves, and cries and leaves us hanging – and caring. During a melodrama, the audience may care about its characters, but not three weeks later. Ms. Gray’s “Zoe” still follows me around. I want to know what happened. Jacobs-Jenkins doesn’t wring the last tear out of us – he is unusually and wisely silent about her fate. Her last several scenes, when her life as a free woman is torn apart as she’s sold as a slave, are just devastating to her and to us. Except in the narrative breaks where Jacobs-Jenkins makes his characters instruct us as to the form of melodrama and his intent with his version of the play, the story ranges from funny to heartbreaking, as do the performances by the brittle yet glittering Mary Wiseman as Dora, a southern heiress who loves George; Ian Lassiter in multiple roles of various races; Maechi Aharanwa and Pascale Armand as battling and loving Minnie and Dido, the funniest out-of-time house slaves you can’t even imagine; Haynes Thigpen as Foucicault and a devoted but sometimes drunken Indian brave; and Danielle Davenport as the desperate field slave Grace. Yes, these are all dreadful stereotypes brought to glowing life by this fine cast. In addition to the actors, who all sing with warmth and/or gusto, the evening is hauntingly accompanied by Lester St. Louis on cello. 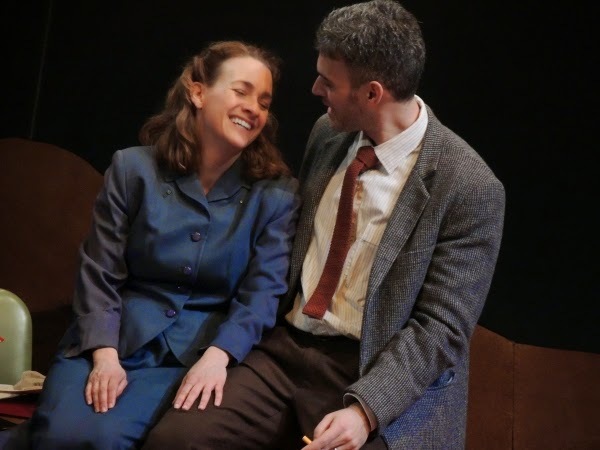 The play had memorable staging and shocks, but some of them were of the sort that hit the audience over the head with a bat, which takes us out of the play and therefore we stop trusting our responses to the story before us. 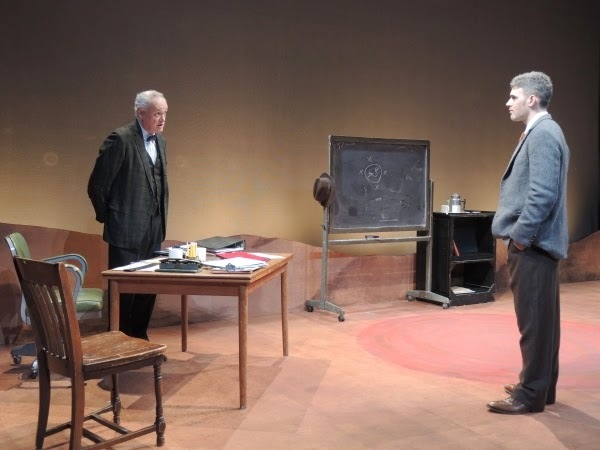 If Jacobs-Jenkins must bracket his play with lectures, he would be best advised to cut them down and let the actors play on our heartstrings and manipulate us more subtly. Some stage pictures were horrifying, some silly, and some unspeakably lovely, courtesy Mimi Lien’s scenic design and Matt Frey’s lighting design. Although I have issues with some of Jacobs-Jenkins more obvious techniques, still I came away from An Octoroon moved and glad to have seen it. I look forward to Jacobs-Jenkins’ maturation as a playwright. ~ Molly Matera, signing off to prepare for an ever busier theatre season.